This Greek-inspired bake, layered with ground lamb and sliced tomatoes, makes a great family supper. Fry the lamb in a large non-stick frying pan for 5-6 minutes, stirring regularly until lightly browned. Drain any excess fat. Stir in the canned tomatoes and rosemary, then allow to simmer for 15-20 minutes until the lamb is thoroughly cooked. Add the pine nuts. Preheat the oven to 200°C, gas mark 6. 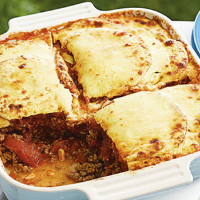 In the base of a 23cm x 19cm x 4cm lasagne dish, place a layer of sliced tomato thenspoon over half the lamb mixture. Repeat with more tomato slices and the rest of the lamb then top with the remaining tomato. Mix the yoghurt and egg together and spoon over the top. Sprinkle with the Parmigiano Reggiano and bake for 30-35 minutes, or until the topping is starting to brown. Serve with a fresh Greek-style salad of tomatoes, olives, cucumber and crumbled feta cheese, drizzled with lemon juice and olive oil. Make the lamb filling up to 24 hours ahead to allow the flavours to develop. Cover and leave to cool, then chill until ready to assemble and cook. Add an extra 10 minutes or so to the final cooking time.